We are eagerly waiting for the professional photos of this blush and cream wedding at The Hutton House in Medicine Lake Minnesota (just outside Minneapolis) but in the meantime, here are a couple of our favorite Instagram pictures of Audrey and Allen's wedding day. An abundance of greenery from the gardens at Studio Fleurette with gorgeous local peonies and other whimsical flowers were used. Gold was the metal of choice used throughout with taper candlestick holders, vases and candelabras. 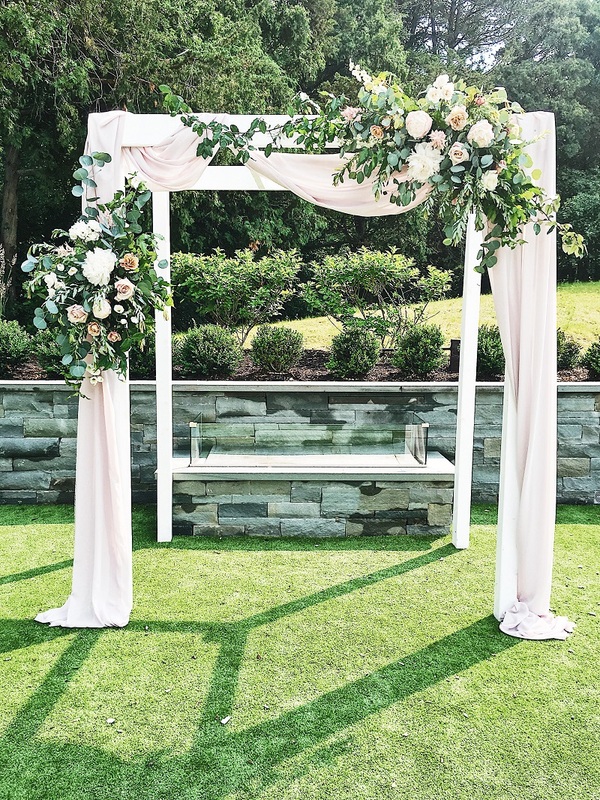 A sophisticated shade of blush fabric was wrapped around the in house modern white arch in the courtyard at the Hutton House where the ceremony took place and lush greenery and flowers climbed the steps inside as a welcoming entrance for the guests.